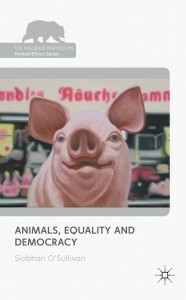 Centre Associate Fellow, Dr Siobhan O’Sullivan’s new book Animals, Equality, and Democracy exposes the inconsistencies in animal protection laws that favour the most popular, best known nonhuman animals. Published this month as part of the Palgrave Macmillan Animal Ethics book series, Dr O’Sulivan’s work also shows that protections vary depending on how we want to make use of a particular animal, with the most visible animals receiving the strongest level of protection. She argues that contemporary animal welfare laws make the lives of animals akin to a lottery. Dr O’Sullivan calls this the ‘internal inconsistency’ and argues that animal protection inequalities offend fundamental liberal democratic values. She argues that this is a justice issue and proposes that both human-animal studies scholars, and animal advocates, turn their attention to the internal inconsistency as a pressing matter of social justice. Information about how to order the book is here.